You’re here either because you’re trying to figure out the best gun to buy for yourself…or the best gun to buy for your wife, girlfriend, sister, or mom. If you’re shopping for yourself, read on! I have lots of advice for you. But if you’re looking to buy for someone else, go grab her first and read this together…because at the end of the day, the best handgun is the one picked by the shooter herself. 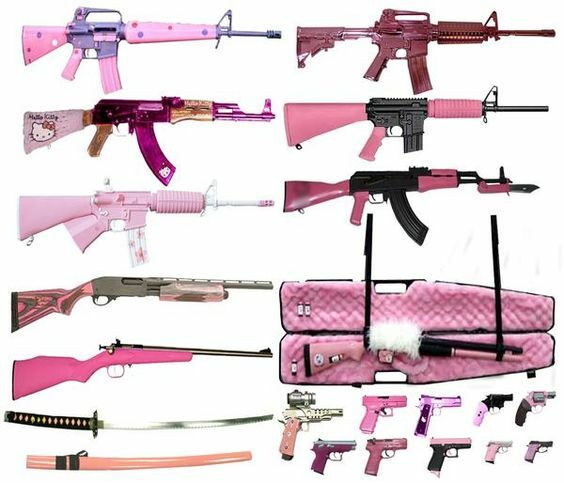 This won’t be some list of tiny pink guns either…I’ll walk you through unique considerations for female shooters and walk through my top 7 handguns for women. And if you’re really new…or never received formal instruction…check out our video Beginner Handgun Course. All of the most important information…with none of the condescending attitude. I’m a firm believer that one of the best long-term gun investments that a shooter can make is a full size centerfire handgun. Rimfire guns, in calibers like .22LR, are great beginner guns because of their low cost and low recoil, but centerfire is more versatile and with more oomph! Want to know more? Check out Rimfire vs Centerfire. While .22LR pistols are fun, a full size centerfire handgun can fill a lot of roles as a plinker, a serious training tool, and a competition-appropriate firearm. Starting with a good one can make the rest of a person’s gun-owning life easier, both in learning how to shoot and run a gun well, and having a “little black dress” that fits most any occasion. Here, I’ve picked out my seven favorite handguns as good all-around choices for women, both as newer shooters and more serious and experienced ones. Sharp-eyed readers will note that many of these are the same guns that are often recommended to men and there’s a reason for that…we’re all human beings! Just that we women might as a general population be a little smaller, with less grip strength and less upper body mass. That largely means very similar guns work as well for women as for men, but with a few allowances such as having more petite grips available. However, that also means that tiny guns actually aren’t a great choice because they tend to be harder to manipulate efficiently (especially with those heavy, stiff recoil springs), and more felt recoil. Easier to conceal on a small body perhaps, but not necessarily a good, shootable all-around gun like these are. Note that most of the guns I’m recommending are 9mm. As our bullet guide points out, it’s a great all-around caliber, reasonably priced and suitable for everything from shooting for fun to shooting for competition to shooting for self-defense while still being low recoil enough to learn to shoot well and even enjoyable. 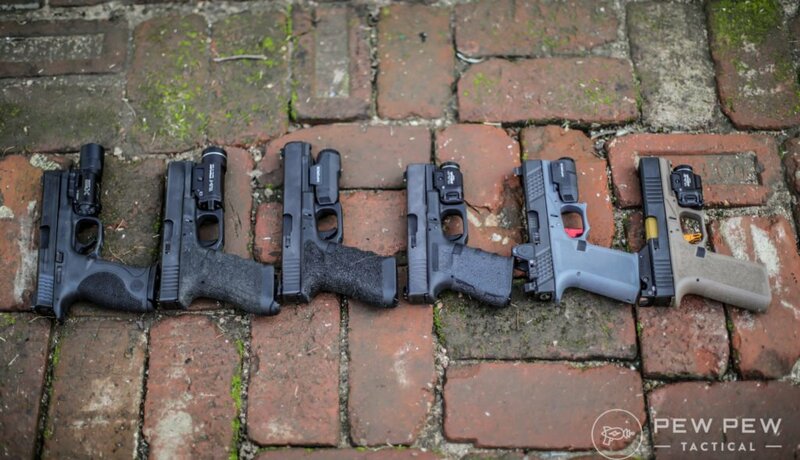 And all of these guns are capable of handling all three, whether they are your needs today or become one tomorrow. 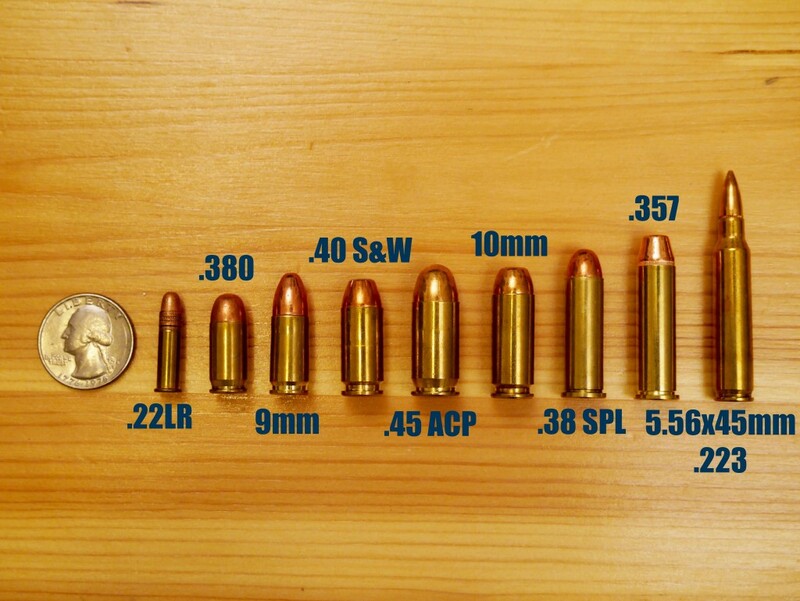 Not to mention, as one of the most common calibers in the world, 9mm is also relatively easy to find on the shelves even when ammunition is in generally short supply. Now that we’ve walked through all that…let’s get into my list (in no particular order)! The Glock 19 ($549) is a perennial recommendation on gun sites and forums, and for good reason. The popularity of the gun is key when looking for help. Between YouTube, forums like Glock Talk, and the dozens of Glock groups on Facebook, chances are pretty good that a girl can find whatever information she needs about her gun, in a way that she can understand and use it. If a woman wants to ask for assistance, it’s out there, but if she wants to be independent and find her own way, that’s possible too. I like the Gen 4 version for women for its modular backstraps for adjusting grip size. Other reasons the Glock 19 is a great girl gun. Like the other striker-fired guns on my list, the Glock 19 is simple to operate with few controls. There is no hammer, just a, well, striker, and the trigger pull is consistent for each shot. Anyone who’s managed to learn how to drive a car or operate a kitchen appliance can manage with minimal instruction and practice. It also has a lot of great accessories available, like all manner of holsters to find the perfect fit whether a woman is an “apple”, a “pear”, or something in-between. 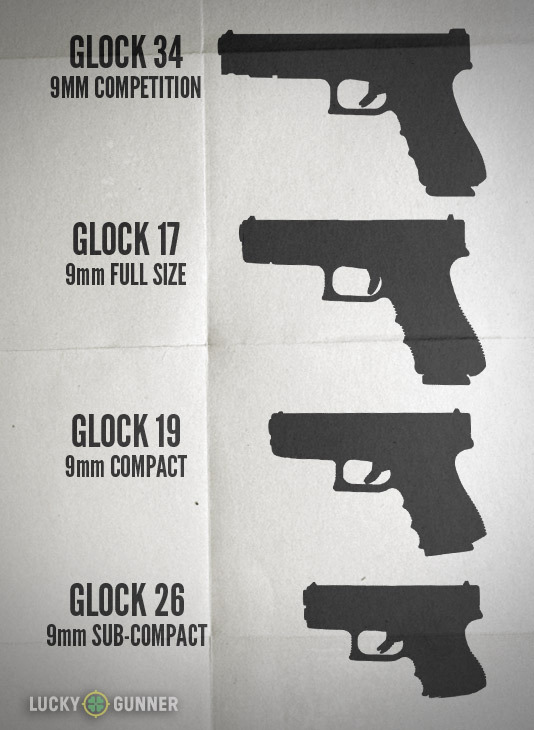 And while the grip is the same size around as other Glocks, the G19 has a slightly shorter grip than its nearest cousin, the popular full-size G17, and the finger grooves on the G19 are adjusted accordingly so they can be a bit more comfortable in small hands. The G19 isn’t so much smaller that it sacrifices the performance and ease of operation of a larger gun, but it’s still a potentially carryable size for many women. A relatively new contender on the block, the P320 ($599) is Sig’s answer to Glock as another striker-fired, polymer pistol. Plus, it was recently chosen as the handgun for the US Army. The P320 has a number of additional features that can be appealing to women shooters though. One of the biggest is that instead of using interchangeable inserts and panels to change grip size, Sig offers completely separate grip modules in different sizes for different hands. 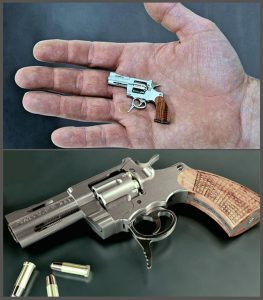 The small size is indeed small, with one of the shortest triggers reaches available in a full-size handgun. We would recommend going with the full size (4.7 in) if you do not plan on carrying it. Otherwise, go with the compact 3.9 in model. The grip modules are reasonably priced and can be ordered over the Internet because the serialized part sits inside them…plus grip modules can be personalized without relatively little risk because damaging one doesn’t mean buying a whole new gun. Caliber X-Change kits are available without buying an entirely new gun, letting a woman invest less but still have a gun in whatever caliber she wants, and in a variety of slide and grip lengths depending on how she’s using the gun that day. Seems like a gimmick, until you realize that the modularity means you can have the same trigger in your carry gun and your range training gun. A great choice for both the budget-minded and the indecisive, not to mention the woman who wants as much as she can in one gun. Another striker-fired polymer gun, the Smith & Wesson M&P9 M2.0 ($499) rounds out my initial trio of easy-to-shoot do-all “plastic fantastic” guns. While many lists recommending guns to women will include the tiny M&P Shield, the standard M&P is a bit more forgiving for long shooting sessions and has a larger capacity. I like the full size, 9mm version, in its simplest form without a manual thumb safety so that all that has to be learned and mastered are trigger, sights, slide, and magazine release. The grip size on the standard M&P is adjustable with a series of backstraps that ship with the firearm, can be replaced without tools, and personalized without the possibility of damage to the gun. The “small” backstrap is quite slim and works with small hands well, but if it’s not small enough, the gun will run without any backstrap at all too, making it one of the smallest mass-market double-stack guns out there. 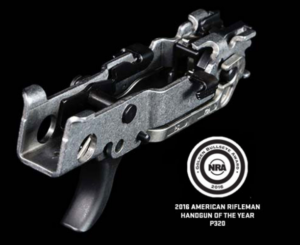 The new M2.0 is now available with a more textured grip and better trigger than the original. 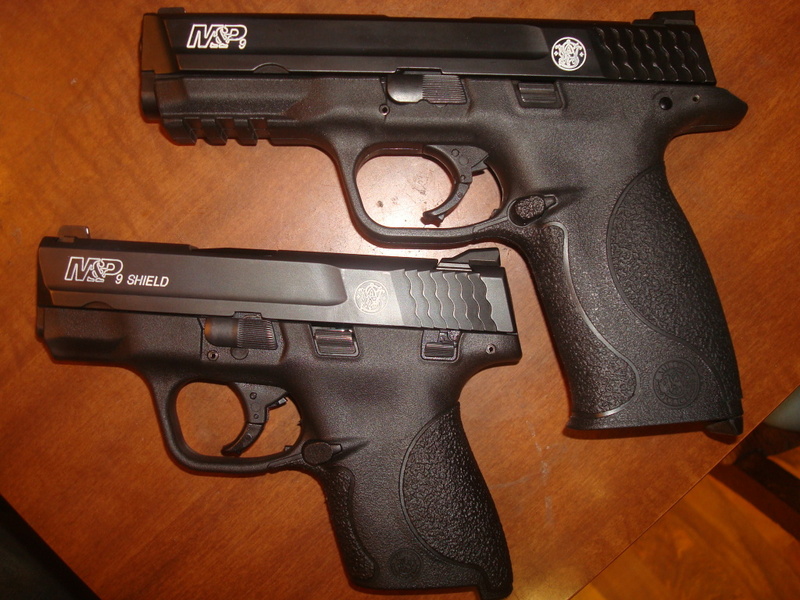 With an aftermarket that rivals that of the Glock 19, the M&P is another great choice for women. 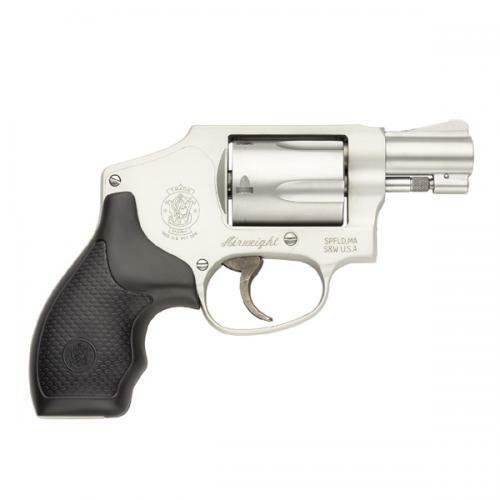 A Smith & Wesson choice that’s under-appreciated for women is the .38 Special Model 66 K-frame revolver ($769). I’m not a believer that girls should shoot revolvers (aka wheelguns) because they’re less complicated, but if the beauty of a classic revolver is what a woman wants, then the M66 is a perfect fit. It’s not the ever-popular Airweight J-Frame ($429), and that’s a good thing. The Model 66 is bigger and heavier, but not a beast…it’s easier to hold and shoot, and it kicks a whole lot less while not being unwieldy. That means learning how to run a revolver and practicing with it doesn’t have to be limited to short sessions followed by nursing bruised hands. If the attraction to a revolver is that double action trigger pull, a Sig Sauer P250 ($429) could be a good alternate choice for a similar trigger but the capacity of a semi-auto. It’s the hammer-fired, double-action-only older sibling of the P320 mentioned above, with many of the same advantages of grip size, accessory availability, and modularity. In fact, the magazines, grip modules, and many holsters are completely interchangeable with the P320, expanding the available selection of accessories and creating an upgrade path to the P320 later on. The double-action-only part of the P250 is a lot like shooting the Model 66 we just covered, which makes it a little harder to shoot than a striker gun, but some shooters might prefer that longer, heavier trigger to provide extra comfort from a safety perspective. Another plus side of the P250 for women shooters who struggle with hand strength and upper body strength to rack a slide or control recoil is the .380 ACP version of the gun. The ammunition will be a little more expensive and may be harder to find, but it’s still passable for self-defense with newer ammunition technology developments. Tamara Keel, long-time gun writer and current Handgun Editor for Shooting Illustrated, calls it a “grandma gun,” and with the utmost respect for my grandmother, I agree – an easy-to-run slide in a package that doesn’t have a lot of recoil and runs reliably has a lot of characteristics that people claim are great for girl guns without many of the common negatives. And as grandma decides shooting is the best new retirement hobby ever, she can move to a more powerful caliber if she likes. The 1911 isn’t a beginner gun in spite of its light trigger. You have the extra manipulation step of dealing with the manual thumb safety, the necessity of properly engaging the grip safety, and the complexity of tear-down and reassembly for cleaning. But if a girlfriend of mine really wanted a classic gun with historic appeal, like the Model 66 revolver above, then I’d point her to a full-size 9mm variation like the Rock Island Armory Ultra FS 9mm ($779). It comes with many of the common 1911 upgrades in place out of the box and in Gun Nuts Media’s year of 1911s, has been one of the most reliable options tested. The all-steel 1911 in 9mm also has very manageable recoil and in the original Government size, is much easier to learn how to grip, manipulate, and shoot than the micro 1911s that are popular for carry. With lots of options for grip panels, including slim versions and ones with cut-outs so that small hands can have less trouble reaching the magazine release, as well as grips in different colors, materials, and textures, they’re easily customizable for both beauty and function too. If a girl wants an even more special gun, the sky’s the limit for a 1911 built by a custom gunsmith after she’s learned what she likes with an off-the-shelf gun like the RIA Ultra FS. Double Action / Single Action (DA/SA) guns that have a long, heavy first trigger pull followed by short and light trigger pulls also aren’t beginner guns, but there are great self-defense, duty, and competition reasons to shoot them. And a woman shooter isn’t a perpetual beginner, so when she’s ready to expand her horizons, DA/SA can be a fun direction. There are a lot of high-quality options, but I’m recommending the CZ 75 B ($599) and BD for their small grips and big aftermarket support in both upgrades and accessories. While some DA/SA guns suffer from too long of a reach from grip to trigger when in double action, but that’s not generally the case with the CZ 75. A word of technical warning: the classic “B” model can only be decocked (that is, returned to double action mode) manually by pulling the trigger while slowly lowering the hammer down, a tricky process even for experienced shooters. However, the CZ 75 B has a manual safety so that it can be shot in single action only mode instead if a woman decides DA/SA wasn’t for her after all, or until she’s had a chance to practice manual decocking. Or she might like the CZ 75 BD instead as it includes a decocking lever, a feature found in only a handful of DA/SA guns. Manipulating the lever is more straightforward and requires less dexterity. With all of these excellent choices, how is a girl supposed to pick? There are many factors, but the first thing you should do is try to shoot all of your top choices, or at least handle them in a gun store. Need some Gun Store Etiquette? 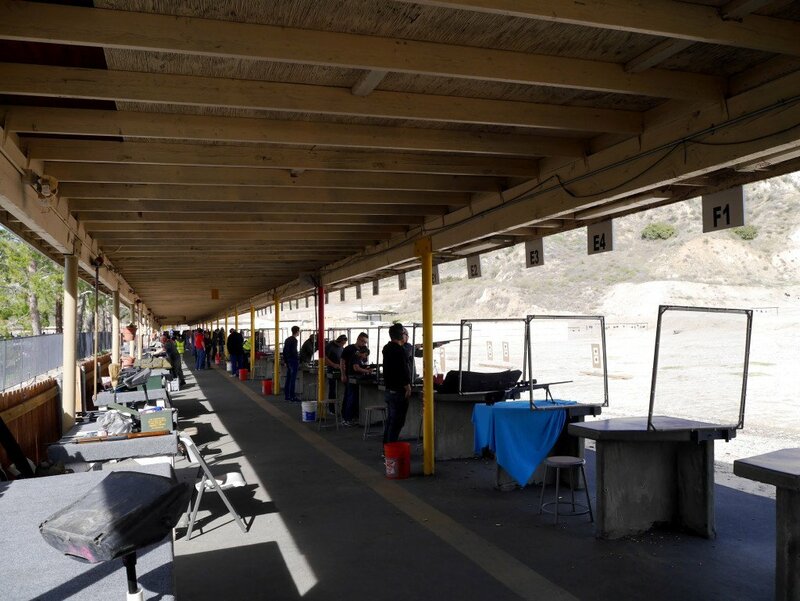 Gun ranges that have rental counters, friends with big collections, or even a friendly acquaintance who shoots are all ways you can try out a gun before buying. Prepare for Your First Trip to the Range. You should also think about your budget, what you’d like to do with your gun, and what kind of accessories you think you might need and whether they exist for your top choices. For instance, consider if you’ll need a holster for a class or to get started in competition. Most of these guns are a little big for most women to hide on-body (we’ll cover some better choices soon), but you might want to try anyway or to be able to practice your concealed carry skills with a bigger gun. For every gun on this list, you’ll be able to get the most common types of holsters, but some of the specialty carry methods may be more limited. Regardless of which one you like best, the guns on this list are all ones that a woman will take out of the safe again and again whether she needs a home-defense firearm, a competition match gun, something to take to a class, or perhaps even for carry. Which particular one is best for a particular woman will depend on where she’s at in her shooting life, but any of them would be a solid choice for a happy shooter working on learning and mastering her handgun skills. However, if you haven’t gotten much beyond “I want to buy my first handgun and I want it to be a good choice for me as a woman”, I’d recommend sticking with one of the first five on the list. They’ll get you started so that you can figure out what you want in your next gun….because just like shoes and purses, just one probably won’t be enough. Let me know which one you eventually choose in the comments! And remember if you want to become familiar with handguns at home…check out our Beginner Handgun Course. Annette Evans picked up her first gun almost ten years ago "because every girl should know how to shoot." 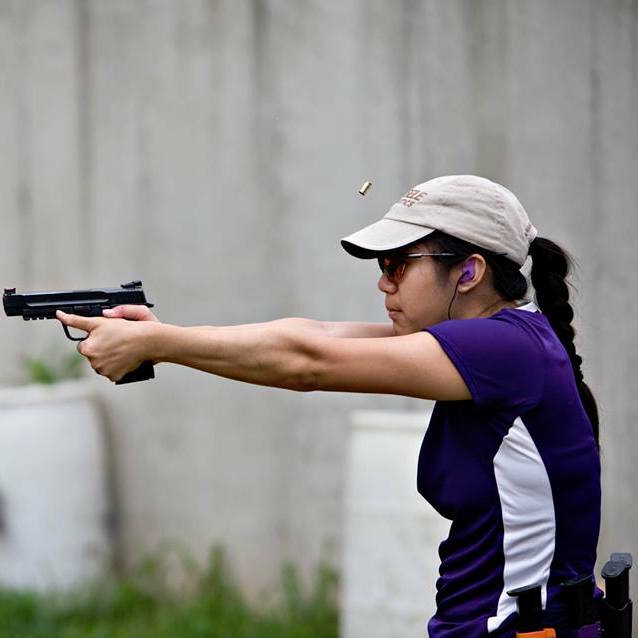 She started as a defensive shooter, became an instructor, then fell in love with competitive shooting. Her passion is the craft of marksmanship, which she pursues as a representative of King Shooters Supply, Grayguns, and Race Street Range. And yes, she finally cleans and maintains her own guns. You can find out more about Annette and what she's up to at Blasting Beauty. Major flaw here….At least at my house, the decision for my woman is what is easiest to rack? My wife chose the Sig p238 because it is easiest to grad hold of and easiest to rack, though she was also looking at the SW380EZ. Still I think it comes does to how easy is it for the woman to use. This is just about the most insulting article to women I’ve seen in a while. Just wow! In a way a girl can understand, if you can operate a kitchen appliance… I assure you women can understand just as much as men, and as for operating a kitchen appliance, you might want to pull your head out of 1950.